Renumerate Orders refers to recounting the existing orders. 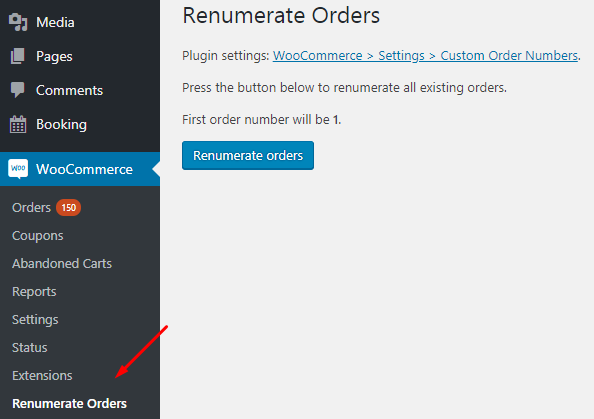 With Custom Order Numbers for WooCommerce Pro plugin you can renumerate orders using the Renumerate Orders Tool. There are 2 ways in which you can access this option and renumerate orders. Let us understand these in detail. 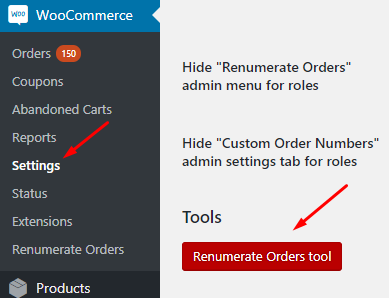 This option appears in the WooCommerce menu list when you install and activate the Custom Order Numbers for WooCommerce Pro plugin. Click the Renumerate orders button to recount all the existing orders. It will notify you about the first order number which is set on the Custom Order Numbers Options page. Because the Sequential: Next order number option is set to 1, you will see the message as First order number will be 1 as shown above. When you can click on the Renumerate Orders tool button, you will get redirected to the Renumerate Orders page as shown in the 1st image. 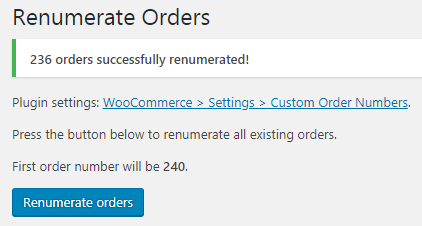 Also, when you are on the Renumerate Orders page, you can access the Custom Order Numbers Options page by clicking on the WooCommerce -> Settings -> Custom Order Numbers link. When you click on the Renumerate orders button, all the existing orders in your backend under Orders page will be renumerated. As you can see, the message displayed also suggests the next order will have the first order number as 240. This shows a total of 239 orders were renumerated, starting from 1 to 239 in an ascending order. Hence the first order placed will have order number 1 and the last order placed will show order number 239 as shown in the above image. The Renumerate Orders option is helpful when you want a systematic listing of all existing orders rather than random ordering. It can also be used for instance, when you want to place test orders on the site before going live. Once thorough testing is completed, you can delete the test orders and renumerate all the orders. This will arrange the orders starting with the sequence set by the client.